I was so close to not making this months Daring Cooks' challenge! Luckily I pulled myself together and pulled through, and I'm glad I did. 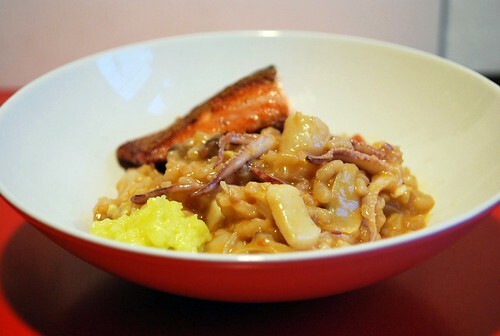 This challenge was supposed to be 'rice with mushrooms, artichokes and cuttlefish,' but we don't sell cuttlefish at my Wholefoods, and I could only find risotto rice as far as short grain rice went. I used scallops, and squid (Alex ate all the tentacles). I also served it with a small piece of salmon on top, because it was on sale and I just couldn't resist. The thing that makes this dish really crazy good is the allioli. You may know it as aioli. Allioli is made from four things, pounded together slowly with a morter and pestle until it forms a light, fluffy cream-like thing. I may have quit beating the oil in just a bit earlier than I should have, but I thought it was awesome. Skip this step if you don't like garlic, because whew, it's sharp. Alex and I both could eat cloves and cloves of raw garlic and not mind it on each other, but you might mind. This month's challenge was hosted by Olga of Olga's recipes and Las Costas de Olga. She chose a recipe by Jose Andres, from his TV show Made in Spain. For the original recipe, check out Olga's blog. In three parts. First, the sofrito, then the risotto, then the allioli. This is basically a marinara sauce. This recipe makes a whole ton, I'm freezing the rest of mine in serving-size containers to reheat in a pinch. Heat the oil in a pan, then toss in the onion and garlic. Cook until softened, then add the mushrooms, and cook until the mushrooms let out their juices. Add the tomatoes and spices and cook for 45 minutes to an hour, stirring occasionally. Heat the olive oil, then cook the mushrooms until starting to brown. Toss in the artichokes and cook 1 minute, then add the rice and cook two minutes, until the rice starts to become translucent. Stir in the wine, add the bay leaf, and cook until the wine is absorbed. Stir in 1/2 c of stock, and cook, stirring often, until the stock is absorbed. Keep stirring, and adding stock 1/2 c at a time, until the rice tastes almost cooked. Stir in the seafood when the rice tastes like it's almost done, like you could eat it but it might need another few minutes. 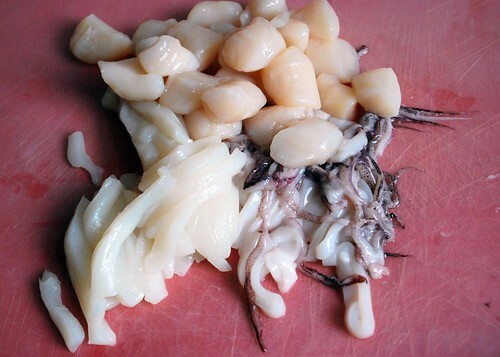 Cook the seafood in the risotto until the scallops and squid aren't translucent anymore. 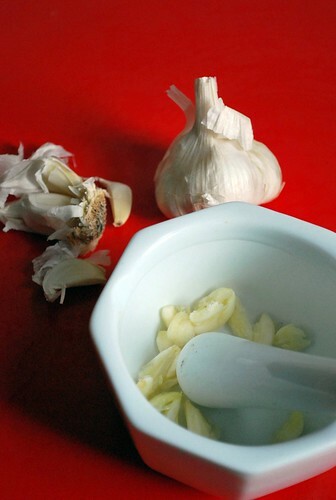 Smash the garlic and salt together with a morter and pestle until the garlic is well-smashed. Smush in the lemon juice, then add the olive oil, a little at a time. Add oil, smoosh in, then add a little more. Keep going. This will take a while. Stop when the allioli is glossy and fluffy. It will happen. 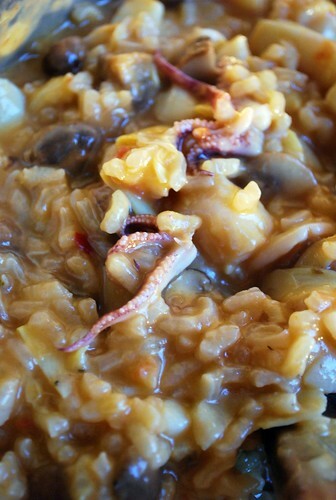 To serve the risotto, scoop into a bowl and serve with a little dollop of the allioli on the side. When you're eating, scoop a tiny bit of allioli onto your fork, then get a forkful of risotto. Delicious and sharp and smooth and seafoody! That sounds truly divine! When are you coming to FL to teach me to cook? Your allioli looks perfect! Mine split and I had to add an egg. Looks great! Love the combo of scallops and squid! Wonderful job!! I love all of the seafood you used - It looks amazing =D!! I'm wishing now that I had tried the squid....instead I went with shrimp. (The family still hasn't recovered from the Skate challenge) Yours looks so delicious, I may have to try it again with squid.....can't get cuttlefish here. We also loved what the allioli did for the dish. Beautiful dish! Yours looks amazing! 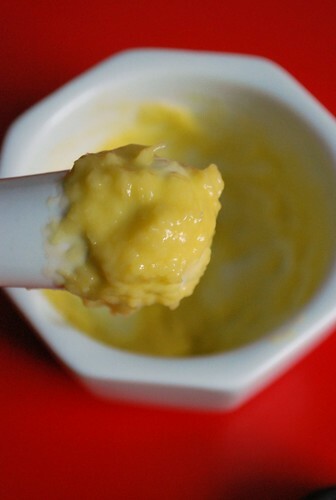 Your aioli turned out perfect looking. Great job! Every single facet of your dish looks amazing. Love the salmon perched on top, and the photos are great! Nicely done! great photos + lovely presentation, this looks delicious! Looks like you did a great job with this challenge! The allioli looks perfect - I'm a fellow garlic lover here! My husband found it too sharp. Well, more for me... :) I love the red background in your photos, very pretty. Nice work with the dish. Looks like yours turn out quite well. Your dish sounds delicious and your allioli looks perfect! Beautiful photos!